Ex-hire HYDROMIX / X21/UTZ 9m3 Volumetric Concrete Mixers (2017). 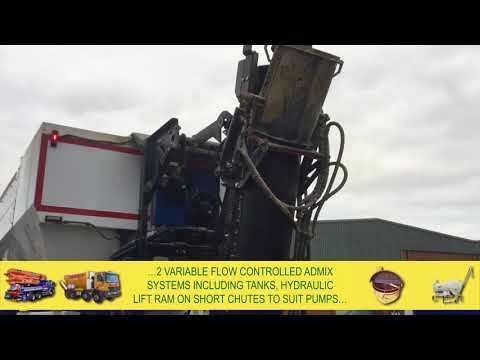 Fitted with 2,000 litre water tank, 9m³ volume bolt on dual compartment aggregate hopper fully braced, 3.5m³ cement bin, hydraulic auger swivel system, hydraulic cooler, high energy 12” auger system, 2 variable flow controlled admix system including tanks, hydraulic lift ram on short chute to suit pumps. Automatic tub chain oiling system, rollover sheet, variable cement discharge system, electric vibrators (4) auto & manual switched, wheelbarrow mounts, 3 x discharge chutes, riser boards on aggregate & sand hopper with extended 8" centre divider, mist mix chamber water system, E stops, auto lube on auger bearing and remote Wi-Fi control. Complete unit fitted onto 2017 '17 plate Renault K460.44 R Heavy E6 8x4 cab/chassis. Power supplied to mixer via PTO. Complementary delivery, training and commissioning within mainland UK. With full warranty.